moneymorning.com Is This a Bear Market? And I could continue, on and on and one with a long list of the former mostly bullish 'analysts' who apparently conclude that stocks are in a bear market. So again it's important to realise that recent bearishness goes well beyond the usual suspects, counting even the usually bullish amongst their number. So exactly how has this new stocks bear market been proceeding? Well the Dow's latest close of 17,215 is at its highest for the past 7 weeks! Now forgive my ignorance but aren't stocks supposed to be falling during a bear market? Rising stocks, let alone failure of the always imminent stock market crash is coming is not bearish price action that supports such widespread doom and gloom. 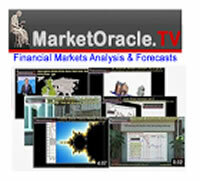 My update of Mid September on the state of the 6 year long stocks bull market series concluded in a detailed trend forecast for the Dow for a brief rally into Mid September to then continue its correction into October so as to set the scene for the Dow to rally by about 20% to over 18000 before the end of this year. Whilst the highly vocal bears may point to bearish chart patterns such as the 'head and shoulders, knees and toes' pattern. Instead clearly the stock market is determined to severely punish the bearish consensus by resuming its bull market a few weeks earlier than even I had originally envisaged. Look it's simple, very simple, stocks are NOT in a bubble, until stocks reach the bubble stage then they are unlikely to resolve into a bear market, having traded stocks for over 30 years, I KNOW what a bubble looks like! In fact the bubble top may turn out to be another 4 or 5 years away! Imagine that a bull market that continues for another 4 or 5 years! IMAGINE IT, now imagine the perma bear nonsense that is going to flow as stocks relentlessly climb ever higher, do you really want to miss another 4-5 year bull run? Yes there could be a shock event that could bring the bull market to a juddering halt, such as the United States electing another idiot for President who perhaps starts another unwinnable war and leaves another crucible for global insatiability behind such as Iraq. So, no its not a done deal but probability continues to favour a continuation of the stock bull market trend as I have been writing of since the birth of the bull market in March 2009 (15 Mar 2009 - Stealth Bull Market Follows Stocks Bear Market Bottom at Dow 6,470 ) and since which time my strategy has remained very, very simple and consistent which is that the "greater the deviation from the bull market peak then the greater the buying opportunity presented". In which case given the recent deviation from its high of 15%, you have just had one of those great buying opportunity moments that it clearly looks like most have MISSED. 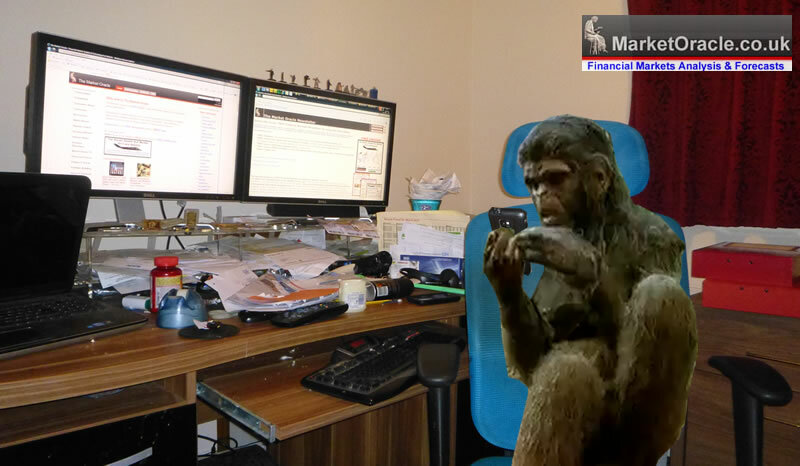 Now it's time to purge my thoughts and conclusions on humanities real mega-trend, on where we stand today and where we are heading to next, the megatrend of the Genus HOMO, HUMANS! My recent video illustrated how the genus Homo (humans) emerged approximately 2.5 million years ago in the era of the australopithecine's that spanned 5 to 2 million years ago, who would have looked and behaved little different to chimpanzees, only differing in their ability to walk upright. From whom perhaps emerged a single individual who had the ability to realise that they could use a bone or stone as a weapon that immediately turned a prey animal that had lived a precariously frightened existence of constantly falling victim to predators into a meat eating predator, and so began the cognitive revolution as demonstrated by idea’s / meme's that quickly spread within and across groups when coming into contact with the one another, whilst those that were incapable of absorbing new idea's would soon become extinct, out competed, leaving behind more robust populations with an ever expanding cranial capacity as natural selection favoured those that could better solve problems and take on new ideas, and so began the journey of the killer ape, the Genus Homo, that ultimately put humans on the path towards extinction as our most deadly weapon of war appears imminent, the ultimate killing machine, artificial intelligence that can out think humans. The primary evolution for the Genus HOMO of the past 2 million years has been largely in the brain, that in the fossil evidence has seen our cranial capacity expand from what was little different in size to that of a Chimpanzee some 2.5 million years ago to now triple the size, as natural selection selected those humans who were able to utilise a constant flow of new ideas whilst those individuals and populations who just could not make the leap in understanding were literally killed of by superior strategies, as one can imagine the leaps in cognition were a mixture of steady progress coupled with great leaps in insight such as using fire for first warmth then for protection and eventually realising that cooked meat / food is far more easily edible and digestible, that greatly boosted our calorific intake giving fuel for the brain to grow. And so by as long as 1 million years ago much of the earth was populated with humans, the species Homo Erectus that would exist for some 2 million years with pockets of Homo Erectus living as recently as 140,000 years ago, and giving rise to many new species of humans apart from us the most known of which is Neanderthal man who would rule over Europe for a good 400,000 years. Human evolution of the past 2.5 million years has been a history of ever expanding cranial capacities from 400 cc of Afarensis to 1600 cc of Homo Sapien Sapiens with an estimated rate of increase of 7cc per 10,000 years for the past 800,000 years. Despite most today still deferring human origins to a creation myth as this offers the promise of eternal life after death, in which respect the creation of man based on the biblical story of Adam and Eve as created by God in his own image in the Garden of Eden of some 6000 years ago does not quite match the fossil and genetic record that primarily evidences a process of evolution by means of natural selection of over 6 million years, as our distant ancestor diverged from other Great Apes, spending 4-5 years as Australopithecine hominids (little different to Chimpanzees) before evolving into the Homo Erectus emerging some 2 million years ago that gave rise to many subsequent hominids of the Homo Genus, including eventually the dark skinned african Homo Sapiens Sapiens (HSS), which emerged with a small population of less than 10,000 by 220,000 years ago in the rift valley of East Africa as indicated by Mitochondrial DNA (passed down through mothers without recombination, differing only due to mutations) as the sub species that all modern humans genes can be traced back to. Following which HSS for the next 150,000 years or so attempted many migrations across sub-saharan Africa that proved successful by between 140,000 and 110,000 years ago. 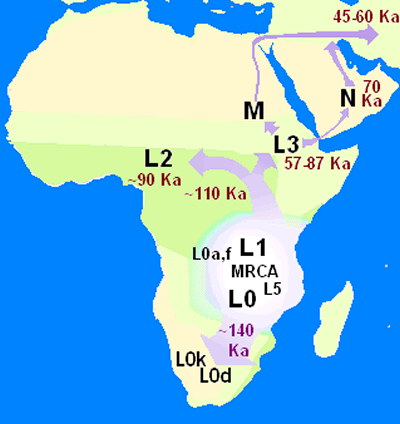 Whilst the migration attempts to leave sub-saharan Africa only proved successful by a small population dating back to approx 75,000 years, which again is confirmed by the DNA of all human's outside of Africa sharing the same Mitochondrial DNA that dates back to this period, the importance of which being that humans evolved from a single region of East Africa and not multi-regionally from Homo Erectus archaic humans that had spread throughout the world long before HSS emerged as many Chinese anthropologists still tend to promote as the origins of Chinese people to this very day despite DNA evidence to the contrary. As HSS hunter gathers slowly spread over tens of thousands of years to replace the earlier mass migration's of hominid species populations both through competition (unable to adapt to the competition from HSS) and highly probably having been hunted and eaten as high calorie foods. Homo Erectus, that itself evolved from an earlier Homo Habilis that it also co-existed with for some time, giving rise to many hominids during its relatively long time-line (-2,000ka to -140ka), such as Neanderthals (-250ka to -20ka), Heidelbergensis (-700ka to -50ka) from which Homo Sapiens (archaic humans) evolved, and many others as isolated populations of Homo Erectus throughout Africa, Europe and Asia continued to evolve in response to differing environmental influences. However, effectively by 20,000 years ago or about 4 times the length of recorded human history, environmental changes coupled with the arrival of modern man had by then out competed into extinction all other archaic human species such as Neanderthals as well as other Homo Sapiens species such as Cro-Magnon Man and Homo Sapiens Idaltu. Homo Habilis (Handy Man) approx 2.5 to 1 million years - First to use tools, gave rise to and co-existed with Homo Erectus. What changed 75,000 years ago when a relatively physically weak homo sapien when compared against the likes of Homo Neandetheral that had a similar sized brain or the even more ancient Homo erectus, that was finally able to successfully start to migrate out of Africa. It appears a bottleneck occurred 75,000 years ago, climate change that had brought Homo Sapien to the brink of extinction with perhaps fewer than a couple of thousand surviving Homo Sapiens, physically far weaker than other human species around at that time, where it was a case of adapt or die and as I pointed out in my earlier video on the Killer Ape that change may have even occurred in a single individual who had an idea that would change human perception for ever. What was the idea ? to Imagine that which does not exist. What was the big revelation / idea that would change literally everything? Turn a physical weakling into the most powerful human species on the planet that would literally go on a rampage across the globe triggering mass extinctions of not just all other human species but tens of thousands of animals and plant species in what amounts to a blink of an eye in evolutionary terms. That change was to imagine as being real that which does not exist as the solution to the problem that big brained human species faced, namely how to cope with death. Whilst Homo Sapiens of 75,000 clearly would not have been the first to ponder the implications of death. However some 75,000 years ago an idea was planted that would change everything, the idea that Supreme beings were watching over humans guiding and protecting them throughout their lives with signs and portents and most importantly of all was the promise that death was not final. And humanity witnessed the birth of cultures centered on Gods AND religions that went far, far beyond the ancestor worship of past human species. But now probably with initially just a single individual changed everything . The power of the idea of deities who actively watched over whole GROUPS of humans who were destined to follow the path set forth for them where the reward would be eternal life in paradise, where every bad natural event such as storms, droughts and plagues were taken as signs of anger from their deities for deviating from the true path set forth for them. The consequences of this for our species was too tightly bind humans into highly co-operative groups of ever expanding numbers, that went far beyond family groupings of that of other human species and archaic homo sapiens, but whole tribes of humans bonded through religion under the protection and in service of their deity which transformed the physically weak Homo sapiens into a truly formidable entity, groups of humans led by the power of divine intervention that sought to please their deities so as to make prophecies become manifest. Why would humans fear the relentless long march into the unknown when as Gods chosen people it had always been destined to be so. Why fear other animals and human species when we had the power of Gods on our side. Q: Why did the Change take place in the a single individual? One only needs to look at recorded history of the past few thousand years to see that is littered with individuals said to be prophets who changed everything during their life times with their deeds rippling out for many centuries and for some even to this very day, for every era in recorded history had their prophets of the day who with absolute certainty were themselves convinced and more importantly were easily able to convince others to follow them as the God(s) were on their side, followers of whom were even said would cheat death as this life was merely temporary ahead of eternal life that awaits all that follow the one true path. What Was the Triggering Mechanism? Hearing voices in the head? This is what 1% of people tend to experience during their life time, hearing voices in their heads telling them to do x,y,z. Today in the West at least we call it Schizophrenia, but in the past it was highly convincing communications with the spirits, even Gods, vessels for passing messages on to tribes that they were special and so was the case with EVERY human tribe. And schizophrenia is just one of many triggering mechanisms for again when looking at recorded history we see countless examples such as near death experiences, fevers when ill, interpreting natural events as signs from above such as lightening and even a sudden gust of wind, let alone the more violent manifestation of nature such as Tornadoes, Tsunami's, earthquakes and volcanoes all of which were perceived in terms of signs of the actions of a higher power. Therefore Homo Sapiens by 75,000 ago were primed through natural selection to start to imagine that which does not exist to be as real as they were. The effect of which was to bond groups together all under a single cause that promises protection in this life and an after life. Passing on the revelations / beliefs to others and future generations which for tens of thousands of years was through song and dance that over time was supplemented by symbols and objects such as cave paintings and carved figures out of wood and bone, objects that would attain mystical powers as they were passed on from generation to generation that were perceived as offering protection to the individual and group as well as acting to bond encounters with new groups who likely shared similar beliefs and symbols. Recorded human history of 5,000 years barely scratches the surface of those who came before spanning at least the past 75,000 years! All reinforcing and engraining into humanity the power of divine intervention and purpose for human existence via their 'messengers' on earth, GODs and RELIGIONs reinforcement of beliefs over tens of thousands of years, whilst those few who were born that were not susceptible or skeptical to irrational beliefs (1%) would either need to learn to keep silent and go along with the group or be expelled and probably in most cases killed off for blaspheming which ensured that there was only one dominant Homo Sapien species and that species was / is Homo Sapien Religious. Every Homo Religious tribe had absolute belief that their gods / spirits were real and protected them, destined to fulfill prophecies of eternal life which through a series of iterations were passed down from generation to generation with ever more sophisticated symbols that helped bond disparate groups together, bonds that even to this day are reinforced via mechanisms such elites inter marrying their children in strategic alliances and fostering the creation of huge trading networks that existed even tens of thousands of years ago which traded objects, food, and new technologies and ideas such as weaponry, all bonded together under shared religious myths, continuously expanding in numbers and spread. So it's no wonder that even today 99% of humans still bow down to supreme beings and in their billions follow the scriptures and symbols of ancient prophets who have laid out their respective paths to follow towards an eternal life in paradise whilst offering protection in this life if their representative priesthood's are obeyed. Homo sapiens now with the power of the Gods and Spirits and their prophets and priests acting as guides were able to finally succeed where all other Homo Sapiens populations had failed for over 150,000 years as they were now armed with powerful religion based cultures that bonded tribes together as they followed the prophets, high priests, healers, and witch doctors to overcome fear of the unknown, even at the risk of death as they were led with near certainty to the promised lands that lay beyond the horizon. For the next 75,000 years Humans would created an infinite number of Gods and religions as reality and imagination merged into one 'dream time', aided by plants that encouraged detachment from reality where everything was perceived in terms of signs and portents, favour and displeasure, as Homo Religious hunter gathers joyfully with God on their side literally sang, danced and killed their way across the globe for the innovation of written language would have to wait another 65,000 years! So the religious myths and doctrine would be mostly passed down in song and dance around the camp fires that over time would become the foundations for ALL future religions each adapting and tweaking that which came before into their own iteration, myths such as Adam and Eve, the Garden of Eden, the battle between light and dark, good and evil and of course that death is not final where instead there was the certainty that a Paradise awaits all those who have passed on to the next world. Genetically the closest living humans to those of 75,000 years ago are the bushmen of East and South Africa (current population 90k), as their Mitochondrial DNA shows evidence that they carry high frequencies of the earliest haplogroup branches in the human mitochondrial DNA tree. The most divergent (oldest) mitochondrial haplogroup, L0d, has been identified at its highest frequencies in the southern African San groups. 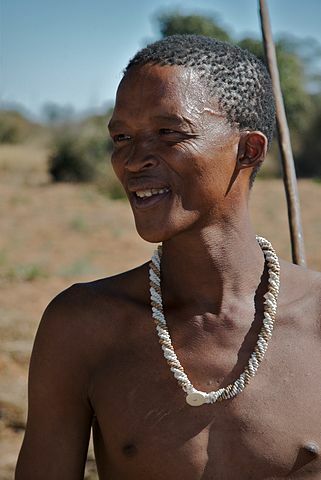 Most of the bushmen remained as hunter gathers until quite recently having been forced to settle down by governments from only the 1960's onwards. A San Bushman of Namibia by Ian Beatty. Whilst many of today's major religions creation myths hark back to the middle east centred around Palestine as to the origins of humanity some 6,000 years ago (Adam and Eve and the Garden of Eden), but the likely truth is that they are not only off by several thousand miles but also by at least 200,000 years. However one thing that religions are very good at is in re-inventing themselves, as we see in that all modern religions which in large part are a re-invention of what came before, for instance the Egyptian book of the dead myths, in addition to the understanding of the world at their respective times of compilation. Thus we will continue to see religions re-interpret vague phraseology so that emerging human origins is said AFTER the FACT to match pre-existing ancient scriptures, and thus some day we are likely to see the story of Adam and Eve and the Garden of Eden migrate several thousand miles southward and tens of thousands of years further in to the past to a new holy land. Just as many Homo Religious can re-invent scripture to conclude that the Big Bang origins of the Universe is alluded to in scripture, despite the fact that at the point of compilation of texts there was no concept of the sun's actual size, let alone the existence of galaxies as the time line for creation of 6,000 years can only match that of 14 billion years if scripture is corrupted to the nth degree to make it fit, that is what religions are good at doing as the population of Homo Religious has been bred to be easily convinced of the reality of irrationality . So no matter how conflicting emerging evidence is, religions will ALWAYS re-interpret themselves to imply that ancient religious scripture born of minds that had no real concept of the physical world as science interprets it today and hence everything is painted in terms of that which can be seen through ancient eyes, such as the Sun and the Moon appearing to be of the same size in the sky and so they were, and that they were always perceived as lanterns acting as a sign for the coming of night and day, rather than the Sun being actually perceived as an object that could generate heat and light that could light up the whole world which has always perceived as being at the centre around which all things including the Sun revolved. Therefore as Homo Religious continues to come to terms with the evidence for human origins, religions will act to reinterpret their creation myths by relocating human creation to be centred around the sub-saharan rift valley of East Africa. 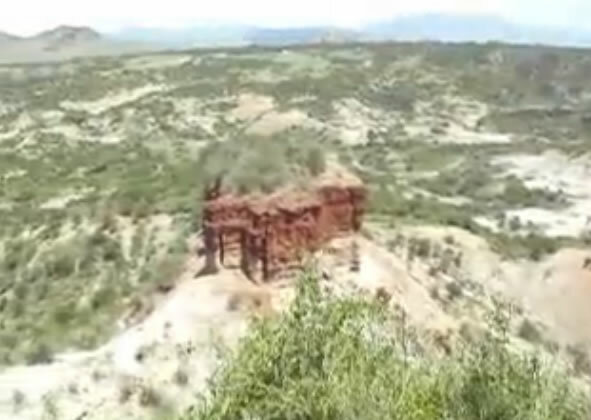 So for a head start all those with a deep rooted desire to worship the past, would therefore be best advised to redirect prayers towards man effected structures of the sub-saharan rift valley of East Africa, from where stories can be re-invented as being the original region of Adam and Eve and their descendants to have inhabited, who were subsequently ordered by God's first prophet to migrate out of Africa some 75,000 years ago. Nevertheless, I can imagine in the not too distant future for many 'holy places' to emerge in the South East African region where new temples of worship will be erected in honour of the revamped creation myths, especially around any signs of ancient human habitation, around bones and where other artifacts are found, just as that which the surviving religions of the past 2,500 years created such locations of in the middle east. Thus, I am sure Sub-saharan East Africa will eventually emerge as focal point for pilgrimage for both existing religions as they morph towards and many new religions coalesce towards that are conjured into existence by the likes of future L Ron Hubbard wannabe's, in reaction to emerging scientific evidence of actual human origins. And so 75,000 years of religious song and dance successfully delivered Homo Sapien Religious in waves of migrations out of Africa. 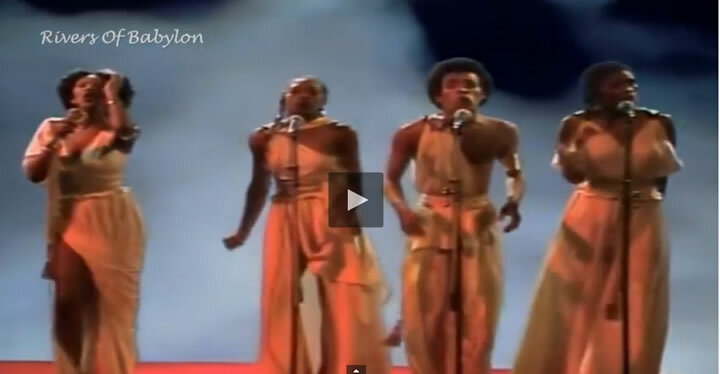 Singing and dancing along the rift valley then branching across and hugging the coastline of today's Yemen, Saudi Arabia, and Egypt to merge and meld in the cradle of civilisation (Iraq and Syria), permanently singing and dancing by the rivers of Babylon for literally many tens of thousands of years. Rivers that today's religious fanatics such as Tony Blair and George Bush have turned into rivers of blood, replacing the crucible of civilisation with the crucible for religious fundamentalism, be it US solider's firing missiles for God and Country into wedding parties or Islamic parties of God blowing themselves up in expectations of immediately waking up in bed with 70 virgins in paradise. Nevertheless, humanity sang and danced and killed its way right across the globe, and despite the songs and dances becoming the basis for all major religions, once people learned to put pen to paper, nevertheless cultures of religious doctrine would eventually class such behaviour (dancing and singing) as deviations from doctrine, pagan heresy, as Christendom would for more than a thousand years attempt to silence song and dance of all past religions as being heretical, that has only very recently been forced to relent in its firm grip over the slave population were allowed to do by passing the mantle of obsessive control onto Islam, where increasingly everything that the Prophet himself is not said to have done personally is haram / forbidden, at the very least to be frowned upon but more likely severely punished or worse, to be put to death! Up until about 10,000 years ago, despite having populated much of the world by then, creating huge networks bonded through shared beliefs that allowed trade and specialisation to flourish between groups of people, nevertheless the life style of humans was still as nomadic hunter gatherers, FOLLOW the FOOD was the primary message and so settlements were always temporary structures, seasonal, that is until humanity was forced to adapt probably as a function of wiping out much of the big mammals by that time, and that great adaptation was the realisation to imagine seeds growing into future crops of FOOD thus avoiding the need to migrate to chase food that was increasingly becoming scarce and so settlements became more and more permanent, expanding in size with each generation as farming became central to religious cultures, offering the gods sacrifices in exchange for bountiful crops. This also marked the start of slavery as the elites appetites grew for wealth and privilege, so continuously skewed religious mythology in their favour so as to indoctrinate the mass of the people (slaves) to tend the fields and maintain the settlements, the 99%, to work as slaves in this life so to reap rewards in the eternal after life, with failure to obey reaping punishment in this and the after life. Thus 99% of people would spend their whole lives on back breaking hard labour so as to support the elite’s privilege and ambitions as they sought to build ever more sophisticated structures out of stone so that they could further reinforce their own status and immortality, proclaiming themselves to be Gods. And so over the passage of time, most people, perhaps as many as 99% of people have always been slaves, literally bred to become domesticated livestock at the bidding of societies elites, this was and still is the case today with every society of Homo Sapien Religious has been bred to be docile and domesticated, told when to sit, stand, walk, run, work, fight and die. However it gets worse, much worse as there are consequences for 99% of people being bred to be slaves. One would imagine that today's humans given the sophistication of our civilisation and advanced technologies and knowledge would be at the pinnacle of human evolution as evidenced by brain size. However, unfortunately settled civilisation's based on domesticated religious slavery have had an very unfortunate side effect which is that today's humans on average have far smaller brains than the hunter gathers of barely 10,000 years ago. Religion, plus agricultural settled civilisations have resulted in on average humans becoming less intelligent. However it should not be so surprising given that Religions have always demanded that people stop thinking for themselves and instead defer to the religious authority, the elite to make virtually all of the major decisions for them, and to accept their mundane existence, one of hard labour in the fields for lower calorific foods than the meat rich diets of our hunter gather past. So it is logical that humans would lose that which they do not fully utilise i.e. an energy hungry brain that had previously expanded in response to humans pushing the frontiers of thought rather than adopting a slave existence where thinking is punished and only strict observance of religious doctrine is rewarded. Therefore in reaction to unthinking, mundane, mostly safe environmentally sheltered lives (no predators, back breaking time consuming work in the fields) that the human brain has in fact shrunk at an alarming rate, as indicated by a study by Super Scholar excerpted below below that makes a convincing case for our brains having started to shrink in terms of cranial capacity 10,000 years ago that coincides with hunter gathering giving way to farming and settlement. 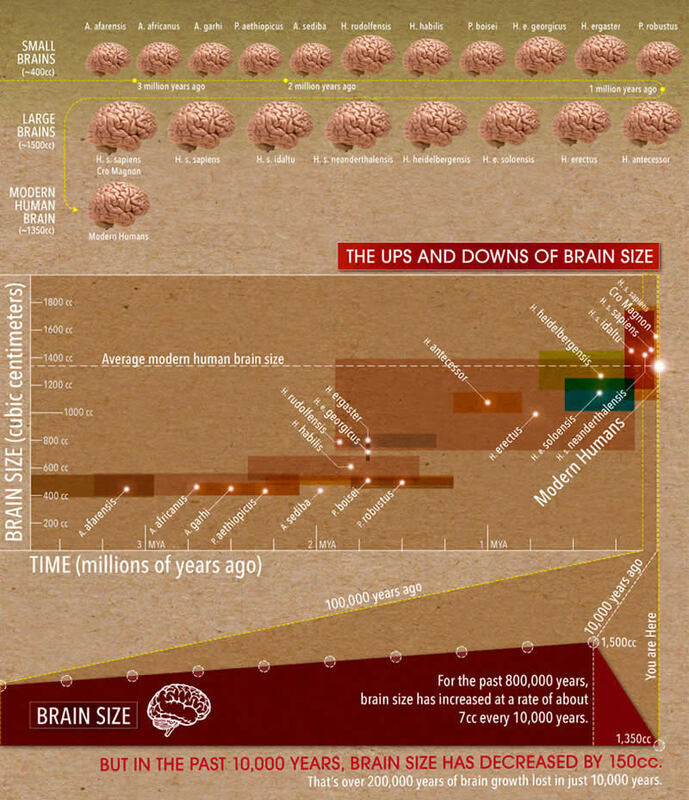 For the past 800,000 years, brain size has increased at a rate of about 7cc every 10,000 years. But in the past 10,000 years, brain size has decreased by 150cc. That’s over 200,000 years of brain growth lost in just 10,000 years. Around 800,000 years ago the earth started experiencing climate ﬂuctuation which coincided with fast brain growth. Cold weather is survived by bigger bodies and therefore bigger brains. Warming trends in the past 20,000 years have favored smaller bodies and therefore smaller brains. The advent of agriculture led to unhealthy grain-heavy diets (lacking protein and vitamins). Body sizes and brain sizes responded. Those with more energy hungry grey matter in their heads would die off, lacking nutrition. As complex societies emerged, those with smaller brains could survive with the help of others. A higher survival rate allowed smaller brains to populate the gene pool. Increased population density leads to increased division of labor. When population is sparse, brains grow because you need to know more to survive. With the division of labor you do not have to know as much. Mistakes in judgment are less likely to be fatal in more supportive societies. The brain constitutes 2% of the human body, but it uses 20% of the body’s resources. The larger the brain, the more fuel it takes to formulate thoughts. As gene pools grow, the most efﬁcient populations excel. As violence and aggression is bred out of domesticated animals, they lost brain mass. Animals that remain juvenile longer are easier to domesticate (like humans). Bonobos have brains 20% smaller than chimps. 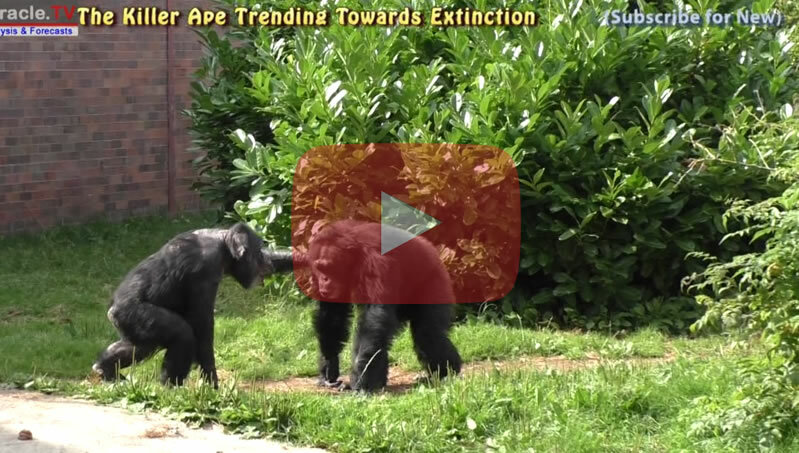 They act like juvenile Chimpanzees, and consequently function as domesticated chimps. And so the average size of human brains has literally collapsed over the past 10,000 years by 150cc, reversing the previous trend for gaining 7cc per every 10,000 years in a process of de-evolution. No Such Thing as De-Evolution? Many may argue that there is no such thing as de-evolution because evolution is an ongoing process of adaptation in response to environmental changes . However, the point I am making is that evolution by means of natural selection for humans had already been slowing for many thousands of years as a greater percentage of humans successfully passed their genes onto the next generation, which has greatly accelerated with the advent of modern science, and its technological and medical advancements, and then came along the welfare states of the past 50 years or so which have not only effectively brought natural selection to a halt but in fact put natural selection into reverse gear i.e. de-evolution, as in countries such as Britain we find that the least productive members of society tend to have many offspring, 4,5,6 or more children. whilst the most productive tend to have only 2,1 or even none. This is natural selection in REVERSE, as the population of the least productive genes is far out reproducing that of the most productive genes which equates to evolution by means of natural selection in REVERSE - DE-EVOLUTION! This has only ever taken place outside of NATURE by means of human intervention. However, I do recognise that De-evolution can only be a temporary state, for it is inherently unstable. So, yes whilst evolution is an ongoing process, however putting natural selection into reverse also means evolution has been put into reverse, so that we are De-Evolving into populations of less adapted towards survival than that which preceded us, on average getting weaker, more susceptible to disease, more obese, less mentally capable which is the trend that societies elite have bred the 99% to become i.e. ever trending towards becoming more docile and subservient, to obey rules and laws without question which the elite themselves don't tend to be subject to i.e. taxes. Welfare States Benefits Culture Fostering Survival of the Weakest! If you don't use it you lose it! Therefore today's far easier more leisurely life styles as compared to our near 200,000 year existence as hunter gathers suggests that today's humans may be fast de-evolving both in terms of brain size and physical capabilities diverging into a new emerging species of Homo Sapien Benefitus. People today in the West at least generally work far less harder for food, than we did barely 50 years ago as today we are cushioned by welfare states and the benefits culture which increasingly a greater percentage of the population is being adapted towards in their totality, enabling the passing on traits for avoiding work or gaining knowledge to future generations, this is by design as the Elite of democracies seek to buy the electorate with bribes (debt money) that rewards those that are least capable of opposing the Elite, so encouraging more to become Homo Benefitus. As an example under the last Labour government the benefits culture had gone completely out of control where people were rewarded for NOT working. The benefits culture encouraged people to maximise benefits received such as non working parents increasing the number of children they had who themselves would go on to perpetuate the self same behaviour of their parents and grand parents which has dire implications for Britains future as the money for nothing generational benefits class that has no inclination for work has continued to grow far beyond the rate of those that work, therefore has lead towards an escalating unproductive tax on the UK economy, as the number of children born into the working and middle class averages less than 2, whilst the number born into the benefits class numbers more than 4, which given the fact that there is little incentive to educate will eventually lead to the dumbing down of society and a drain on future productivity. Despite 10 Years of debt fuelled Economic Boom into the End of 2007 the Benefits Class had continued to grow relentlessly to total more than 8 million of those of UK working age population of 28 million (29%!) as the Labour government had succeeded in creating a dumbed down voter pool that they could call upon to march to the voting booths at each election, however it had sown the seeds for the further destruction of civil society both in terms of monetary costs and soaring crime rates as we have seen the consequences of in numerous news reports of feral youth roaming the streets intent on crime and vandalism as those on benefits have children that they have no real intentions of raising into productive members of society. I have touched on the economic consequences of Britains' benefits culture many times over the years as illustrated by the below graph of what Labour did during its 10 years of social engineering (22 Apr 2010 - Real U.K. Unemployment is 5.5 million, the Jobless Economic Recovery?). Whilst the subsequent Conservative Government despite all of the rhetoric has abysmally failed to deal with the fact that the welfare state continues to fostering the expansion of an evolutionary dead end. The bottom line is the benefits culture, neither benefits the current or future generations as it effectively accelerates the process for dumbing down of the next generation by passing on genetic traits for greater obesity, less physically and mental activity. Similarly it results in an dumbing down of society economically and socially as fewer workers support an ever expanding population of economically inactive the consequences for society will be seen long before this makes itself manifest biologically in that of turning countries such as the UK into third world nations, which implies a far worse fate for today's third world nation's who's ongoing population explosions suggest a drift towards societal collapse and hence the mass migrations of Homo Religious so that they may become Homo Benefitus. Even worse is that the Labour years had seen the expansion of the Benefits Class to those who worked, so that through in work benefits such as Tax Credits, working families are still being encouraged to under work and under achieve so as to maximise tax credit benefits, effectively accelerating the process for conversion of an evolutionary more robust Homo Sapien Religious into Homo Sapien Benefitus that probably already totals 50% of Britians' working age population. However as mentioned earlier Homo Benefitus is clearly a unsustainable evolutionary dead end, which implies a bottleneck event lies ahead for mankind that will swiftly deal with such unsustainable anomalies. By now you may be wondering that if the world has been populated for eons by subservient Homo Sapien Religious and recently supplemented by the even less capable Homo Benefitus then how did mankind manage to achieve all of the break through's in science and learning all the way to today's advanced societies?